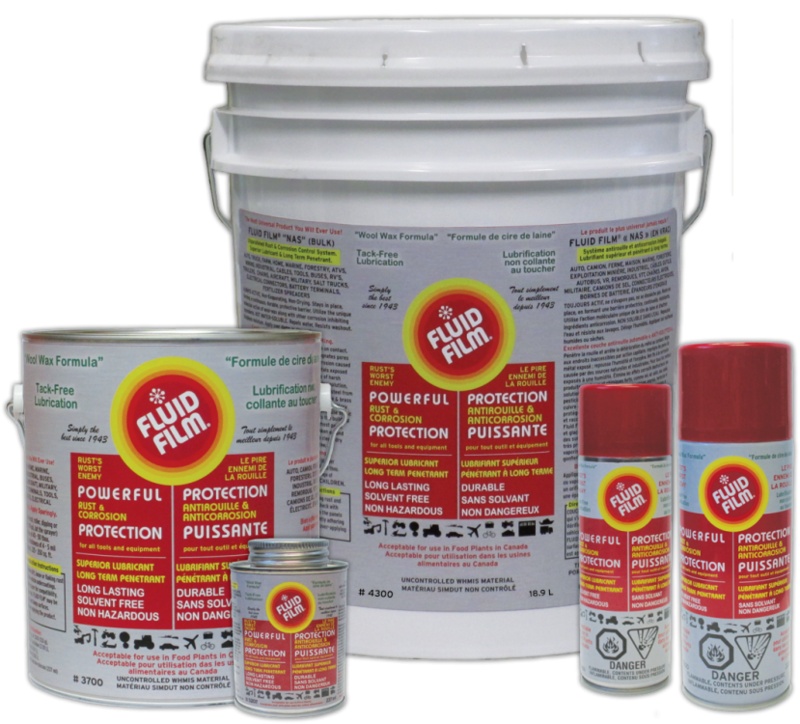 Rust's Worst Enemy, Fluid Film is a solvent free, non-toxic, rust and corrosion protection solution. Utilizes the unique molecular action derived from wool-wax, a nature-given material (lanolin) and other corrosion inhibiting ingredients. One of the best lubricants and corrosion control agents found in nature today. In use for over 60 years in the highly corrosive marine environments of ships and offshore drilling rigs. 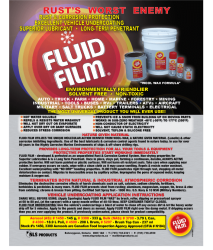 Fluid Film - developed and perfected as an unparalleled rust and corrosion control system with non-drying properties for superior lubrication and is a long term penetrant. Once in place, it stays put forming a continuous, durable, always active, protective barrier. Will not harm painted or plastic surfaces. Will not harm oil resistant seals. Take care when applying near rubber. If overspray occurs on seals, wipe with a clean cloth as it may cause swelling. Repels and resists water washout. Excellent water proofing with “no drip” bonding properties. 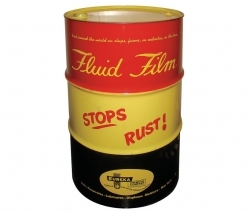 Fluid Film penetrates right through rust, stopping all metal deterioration on contact. Migrates to inaccessible areas by capillary action. Impregnates the pores of exposed metal, keeping moisture and oxygen out. Elliminates the destructive corrosive effects of harsh chemicals such as salt, calcium, sodium chloride, fertilizers, herbicides, pesticides and many more. Fluid Film prevents steel from rusting; aluminum, magnesium, copper, tin, brass and zinc from oxidizing; chrome and bronze from pitting. Certified salt spray test - 1800 hrs. US navy and 10 NSN (Military Numbers). Shake well before using. Apply Sparingly. Apply Fluid Film “NAS” by brush, roller, dipping or pressurized sprayer at 60 to 80 psi (at the sprayer) with spray nozzle orifice of 40 - 50 thou. Keep Container Tightly Closed. 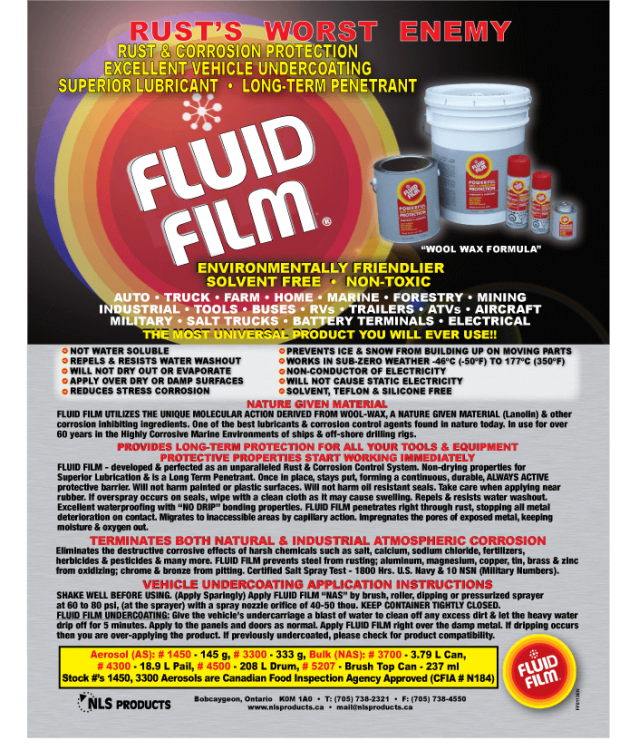 Fluid Film Undercoating: Give the vehicle’s undercarriage a blast of water to clean off any excess dirt and let the heavy water drip off for 5 minutes. Apply to the panels and doors as normal. Apply Fluid Film right over the damp metal. If dripping occurs then you are over-applying the product. If previously undercoated, please check for product compatibillity. 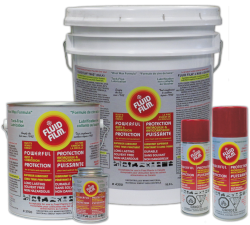 Rust's Worst Enemy, Fluid Film is a solvent free, non-toxic, rust and corrosion protection solution distributed by NLS Products.